Within Adventism, no topic matters more than the one Edward W. H. Vick addressed in his 2011 book, From Inspiration to Understanding: Reading the Bible Seriously and Faithfully (available in paperback or on Kindle). Vick, who taught many years at Canadian Union College and now resides in Nottingham, England, earned degrees in philosophy and theology from three British universities, including Oxford, and took his doctorate in systematic theology at Vanderbilt University in Tennessee. During the 1960s he taught at the Seventh-day Adventist Theological Seminary at Andrews University. He has written a dozen or so books on a wide range of theological topics. The following interview, conducted by Charles Scriven, chair of the Adventist Forum Board, addresses themes from the afore mentioned reflection on the Christian doctrine of Scripture. Question: The title of your book on Scripture reflects one of its main themes, namely, that the metaphor of “inspiration” is a misleading way to discuss the status and importance of the Bible. Why is that so? Answer: Let me say, to begin, that I worked from two guiding principles. I first asked what happens with the Bible in the Christian community. 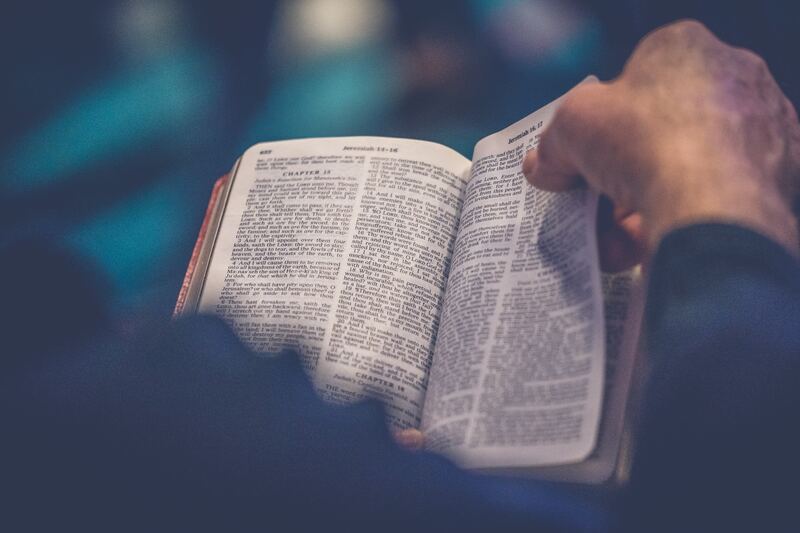 What does the church do with Scripture? What is its practice? This requires faithfully reporting on how, in worship, devotion, interpretation and evaluation, the church actually approaches and treats Scripture. The second principle was that of explaining the church’s practice, or of putting the practice, so to speak, into theory. This means asking how the church itself has explained the status of Scripture, and seeing whether that explanation is consistent with what it actually does. We notice at once that a certain process of interpretation determines how the Bible is read. Certain principles of interpretation become standardized and form a tradition for understanding the Bible. That hermeneutic tradition declares that the Bible is to be taken as the guide for doctrine and for practice. One result is a manifest concern for the authority of Scripture. So now the question comes to mind: How is it that the Bible came to have the authority it has in the church? Well, we must talk about the story of its composition, of its sources and how they were put together. How did what were at first oral traditions come to be put into writing, when, and why? What process, furthermore, governed how some written documents, but not all that were available, became part of the sixty-six-book collection we think of as the biblical canon? Finally, why does the contemporary Christian accept the decision made long ago about which books should be left in or left out? The traditional defense of the Bible’s authority brings me to the title of the book, From Inspiration to Understanding. Many have said, and still say, “The Bible has authority because it is inspired.” That is the basic issue the book examines. And this brings us back to my question: Why do you think the metaphor of “inspiration” is a misleading way to get at the status and importance of the Bible? Again, how does the Bible come to have its authority, its influence in the life of the church? The Bible is testimony concerning what God has done. Scripture bears witness to claims concerning God’s revelation in the story of the Hebrews and of Jesus; and of the acceptance, by the first Christians, of Jesus as the Christ. These are historical claims. But Christians make another kind of claim, based on later and contemporary Christian experience. They recognize claims about the revelation of God in Jesus Christ as authentic because, in reading Scripture, they experience God’s revelation and find it a genuine reality just as the earliest Christians did. They testify to that reality knowing it is not amenable to proof. Yes! The revelation to which Scripture testifies cannot be demonstrated. A theologian who was a chaplain in the army remarked that he constantly met soldiers who told him they could not have faith because as they read Scripture they could not identify with the ancient understanding of the universe that provided the context for the writings. So he answered by distinguishing between the framework, or worldview, in which a message is placed, and the essence of the message itself. You can hold on to that essence without supposing the worldview, as the ancient writers did, that the earth is flat, or that the sun moves across the arch of heaven. So the Bible, the written word, is not identical with the divine revelation to which it bears witness. Just think of Joshua, who demanded that the sun stand still. Astronomers today would have a lot to teach him. But again, what is the text of Scripture actually supposed to do? The point, Christians say, is that when the Bible is read it becomes the medium of a very particular event, or experience: the revelation of God through the influence of the risen Christ. And that is what matters. The words are inert and lifeless apart from the experience; they come alive when they mediate knowledge of a living reality. To exert influence, the Bible must be read, it must be interpreted. But the church and its members are human and prone to error, so what really assures the authenticity of the Christian message? Readers can approach the Bible devotionally, reading it for comfort, spiritual uplift, assurance, a relationship with Christ. They can also approach it with the purpose of establishing doctrine within a particular context, or church community. As the community develops, new questions arise, new concepts emerge, and new decisions have to be made. The text itself is established by means of skillful scholarship. It’s “there.” From such a text the church derives its doctrines. Then these doctrines come to be defined as orthodox, or what the church’s administration requires that you believe. And when questions arise, church leaders must defend their method of interpretation. They must explain how the doctrine was derived from the text. Please note that I am describing church practice. From what the church does we can make firm propositions about the position and status of Scripture. And we don’t have to speak of “inspiration” in order to achieve this result. Yes, but what about authenticity? How can we assure, or at least endorse, the integrity of effort toward the establishment of doctrine? Doctrine is derived from particular passages of Scripture. First there is selection of texts considered relevant. Then, when one or more passages have been interpreted doctrinally, the astonishing claim is made that this is “what the Bible teaches.” Such claims are sometimes made even when different passages from other parts of Scripture present contrary positions. Closed definitions of acceptable doctrine can restrict understanding by unduly confining the message of Scripture. An example is when the primary focus confines attention to certain selected texts that Adventists have focused on in a few favorite apocalyptic passages. Say more about the Adventist tradition of prophetic interpretation. Our forebears retained certain key features of prophetic interpretation they inherited from the Millerite movement. Miller saw all Scripture as on a level. He could draw proof texts from any part of it and place them in his system. He saw himself as a man of the concordance. He even used the term “promiscuous” of his method. Following the Great Disappointment, believers who had expected the end of the world and their translation into “heaven” had to come to terms with their situation. Could anything remain of their beliefs? One group seized upon a new speculation from Hiram Edson. According to him, the expected cleansing of the sanctuary was happening in heaven, not on earth as Miller had thought. That would take time. The destruction of the earth would come later, in its turn. The idea that Jesus was now a priest in a heavenly sanctuary meant that they had time to reassess, and rebuild. Their hope in the Advent could be renewed. They were reassured. These early Adventists had to admit their dating error, or their hermeneutic error, or both. They admitted neither, but instead re-interpreted the reference of the key terms in their key text, Daniel 8:14. They thus decided to continue employing the same method of interpretation that had produced the Great Disappointment. Over time, how has all this affected the way Adventists deal with the Bible? 1) In developing doctrine from the text of Scripture, do not ask questions like the following: date of composition of the books, how the final text was compiled into “books,” what the relation is between passages which are duplicated within the books, how different versions of events are found in the individual books, etc. 2) Treat all passages of Scripture as of equal value as sources of doctrine. 4) Attempt, where appropriate, to coordinate the text of Scripture with future events and so make predictions about that future, even specifying dates or periods of time in relation to those future events. This became a dominating concern. Adventists have, uniquely, the God-given mission to foretell the future of the world and to characterize God’s coming judgment. In the course of all this, some themes, like that of the sanctuary, have taken on a shape quite different from what the original text suggests. What are some of your constructive suggestions for us as we struggle toward greater integrity in our interpretation of the Bible? 1) Let’s learn to show some humility in asserting our claims. That shows up in being willing to discuss, and if need be, revise them. 2) Let’s recognize the importance of considering talks and writing, by competent people, that develop ideas and methods that are new to us, or have even been overlooked or rejected. This will lead to honest and sincere discussion. 3) Let’s realize that we cannot retain all the results of the conversations that took place during the immediate post-Disappointment period. 4) Let’s allow that Scriptures consist of very diverse contents. Each of these requires its appropriate understanding. The apocalyptic elements are important, but cannot be the single, or even the primary, model for understanding the divine revelation. 5) Where discernment is required (and when is it not?) let’s be sure to appoint committee members who have some competence in their knowledge of Greek, in the history of the text and in the story of its acceptance as Scripture, some awareness of Hebrew and relevant historical contexts.